Written, directed, and produced by Vishal Bhardwaj, the film features Imran Khan, Anushka Sharma and Pankaj Kapoor in lead roles, whilst Shabana Azmi and Arya Babbar will be seen in supporting roles. The music has been composed by the dynamic Vishal Bhardwaj, with the lyrics penned by word maestro, Gulzar. 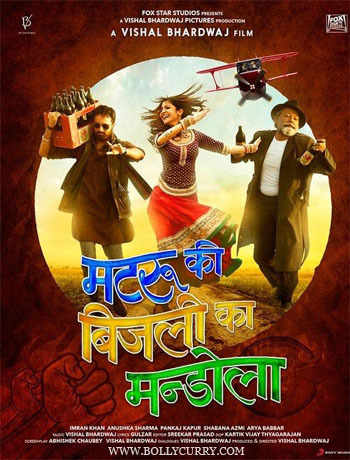 The movie is a comedy drama which showcases the journey of Matru (Imran Khan), whose life becomes entangled with that of Mandola (Pankaj Kapoor) and his daughter (Anushka Sharma), who is in turn all set to marry Badal (Arya Babbar), the son of a powerful politician Chaudhari Devi (Shabana Azmi). The film, which is said to be set in Haryana, is slotted to release on January 11, 2013. BollyCurry wishes the film a great success! Editors: Fari L. & Jenifer Y.
FOY: Shammi Kapoor SRK's romantic avatar in JTJH!